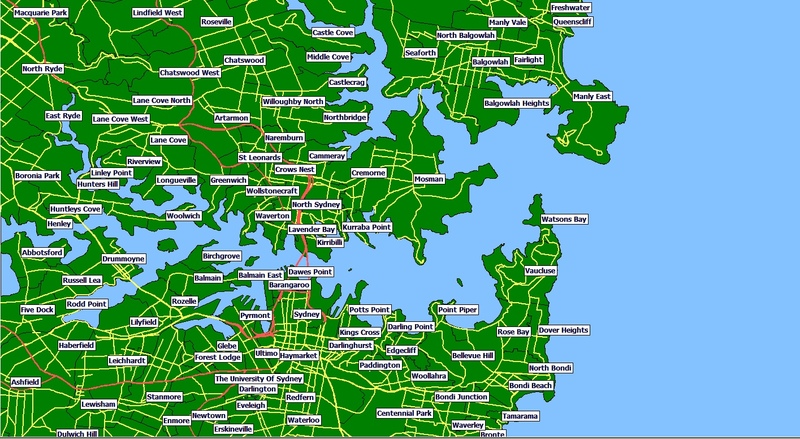 Distance tables are ideal for web services relating customer query to find nearest postcode or suburb and is the basis for such search applications such as "find my nearest..."
October 2018 - The By-Road Distance Table has undergone a massive upgrade in coverage from major metro and surrounds to major metro and 300+ kms in extent. The example map shows NSW and VIC as an example of the increase. Postcodes are the best choice for the simplest use entry to accept and validate and is also the smallest distance table to load and suits most applications where a reasonable number of possible search results is likely. Suburbs are the best choice for high levels of accuracy where fine tuning of distance, eg 2 kms, 5kms, .. is desired since the individual suburbs are used, instead of whole-of-postcode, give good results in both metro and regional situations and where large numbers of potential results may occur (eg real estate). This is the simplest method of distance comparison, and typical of basic point-to-point coordinate based applications but expressed in a table format for simple database lookup. This version is suitable for budget applications and where a basic search results sorting is sufficient or where the number of likely results is relatively low. When the locations are within a major metro area (eg Sydney, Melbourne, Brisbane..) the shortest major road distance is calculated to give a true distance value compared to the simple straight line case. This version is suitable for when high quality search results are required. Australia's best postcode distance search product just got better with new suburb names list, postcode type and major region table and compass direction now included! Available in both Australian and New Zealand editions. Uses straight line distances from postcode centre to postcode centre. The straight line version is ideal for tight budget applications where basic sorting is the main criteria. Uses distances by major road from postcode centre to postcode centre where both postcodes are within major metro area and uses straight line distance elsewhere. The by-road distance version is ideal for more demanding situations where accurately selecting only those locations within true travel distance of the search location is required. The by-road version takes into account all and multiple harbour and bay crossings and other transport restrictions that exist between any 2 locations. The product comprises a set of records ideal for direct use in a database system - no complicated 3rd party software licences or costs - you use your own familiar and compatible tools. A sample of the table record contents are as below. The postcode pair is unique with the distance between them in the 3rd column. All distances are in whole kilometres between the centre of each postcode. The format of the records is identical for either version, it is just the distance column that differs in actual value. All special postcodes, such as GPO Boxes and others, are included so every valid Australian and New Zealand Postcode exists in the table to cover every circumstance. Australia's best detailed suburb distance search product just got better with new suburb names list, postcode type and major region table and compass direction now included! Uses straight line distances from suburb centre to suburb centre. The straight line version is ideal for tight budget applications where basic sorting is the main criteria. Uses distances by major road from suburb centre to suburb centre where both suburb are within major metro area and uses straight line distance elsewhere. A sample of records is available in .CSV format for free download and testing! Licences are available for single user, network multi user,commercial and web useage. Contact us for details.